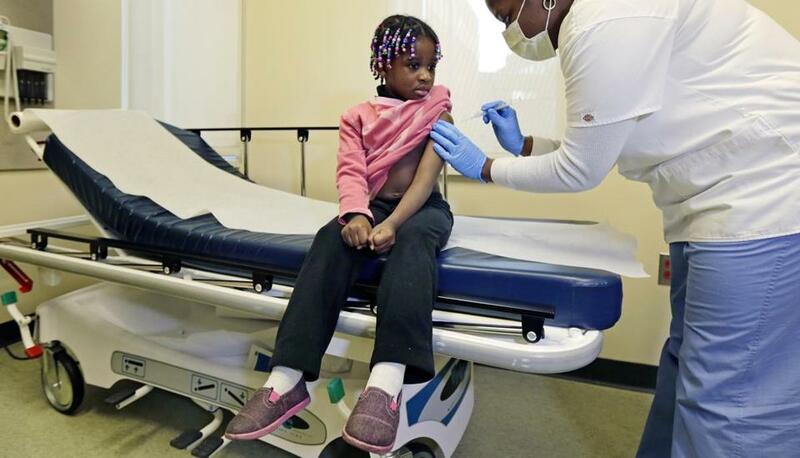 Four-year-old Gabriella Diaz got a flu shot at Whittier Street Health Center. After a turbulent week in which 20 workers were suddenly let go and then rehired on the eve of a union vote, employees at Whittier Street Health Center have overwhelmingly voted to join 1199SEIU United Healthcare Workers East, becoming the first community health center in the state to unionize professional staff. Whittier chief executive Frederica Williams sent a note to staff Thursday acknowledging the “last few tumultuous weeks” and vowing to move forward together. Williams had said the layoffs were because of financial trouble after two grants failed to come through, but the union and the workers insist it was done to suppress the union drive. Management conducted an aggressive antiunion campaign, they say, requiring them to attend mandatory meetings led by outside consultants laying out a case against unionization. Last Thursday, 20 workers, many of them union supporters, were unexpectedly laid off, some in the middle of their shifts. After a raucous protest outside the Roxbury center and an intervention by Mayor Martin J. Walsh, the workers were reinstated Sunday, only to be blocked from the property when they tried to enter Monday. On Tuesday, the workers were officially rehired.